In the year of 2012 I finished collecting all of the known paved ascents going above 2000 m in the Alps, Pyrenées & Canary islands (cycled 240 times above 2000 m). After visiting anc cycling them I made a collection about the most beautiful climbs and I wrote introductions about them, added videos and photos and maps of these great ascents. You will find well known ascents (like Pico Veleta, Passo dello Stelvio or Col du Galibier) and hardly known ascents (like Plan du Lac (2362 m), Männlichen (2229 m), Taunernmoss See (2088 m)) among them. I know that the adventure the experience depends on the weather that I had when I cycled there, and there can be another roads, that I haven’t visited yet, so there could be few onother ones which may be wonderful too. I’m curious if You show me that climbs! Have a good time with them ! PS: The 2nd half of the collection will / should be finished in 3-4 weeks time. Last year, in August I cyled few in Tirol, Austria, Europe. I visited the highest paved ascent (top: 2829 m) of the Alps (Ötztaler glacierroad to the Tiefenbachglacier ) and remembered my memories that I got 8 years ago. We had wonderful weather, so the video is wonderful and shows well how steep and hard it was. The ascent is - except 0.5 km - 10-12% for ca. 12-13 km long. Have pleasure with it ! Now I show one of the hardest ascent of Austria. It is situated in Tirol: Zillertaler höhenstrasse (2015 m) which is a panoramic road. It has 5 sides: each of them is 10-12% steep. at ca. 1488 m, but to the viewpoint, Zirmstadel (1800 m) and Kaltenbacher ski-house. That wass ca 10-11 kms long with 11,4 % steepness. Wonderful view along the road. Then after rolling down to the junction, I went on cycling up to the highest point: Melchboden (2015 m): view to snowy mountains. In the following weeks I will edit new videos about each day (1st: Granon, then La Bergerie du Bois Noir) to have videos (in my collection) about all of the paved climbs finishing above 2000 m in the French Alps. Have pleasure with the video ! In the winter holiday I edited the last 2 remaining videos I missed to have cycling videos about all of the asphalted climbs - ending above 200 0m - in the French Alps. La Bergerie du Bois Noir (2010 m). This is a hardly known ascent in France. The paved road finished at 2010 m. I loved this climb ! It's worth visiting ! Col du Granon is a steep (9,2% for 1053 m heightdiff. --> so it's harder than the ascent of Alpe d'Huez) and wonderful climb; one of my favourite ascents. 80% of the ascent is a panoramic road and there is almost no traffic: I met ca. 2-3 vehicles during the climb. Up to now I visited twice and both occasions I rode it in sunny weather. Have pleasure with the - I think : great - video ! 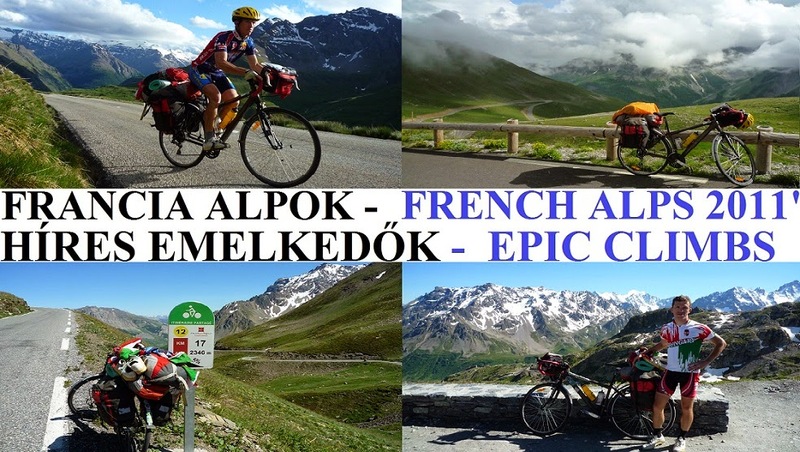 I'm pleased to present a so-called best of video but also a spinning / indoor cycling video: I edited it using wonderful places where I have ever cycled in Europe: like Nice, legendary ascents in the Alps, Andalucia, in the Pyrénées. Few climbs climbs in the video: Mont Ventoux, Passo di Gavia, Bonette, Galibier, there are ascents that hadn't been filmed was rarely filmed ( Dürrboden), Col de la Core, Peyresourde, Ordesa National park in the Pyrénées, Pico Veleta (3394 m) in Andalucia. Few minutes about famous cycling challenges can be seen too: Monte Grappa challenge (261 km + 7241 m), Ötztaler radmarathon (228 km + 5500 m), Valtellina Extreme brevet (345 km + 8998 m). Have pleasure with the video & thanks for watching ! I'm happy to show another compilation / best of video about another great bicycletour in the French Alps with several legendary climbs, ascents. The tour happaned in the year 2011. After the first 2 days (in Italy ) I cycled in France and visited famous, Tour de France cols, climbs, like Bonette (2802 m), Col d'Izoard (2360 m), Alpe d'Huez, Col du Galibier (2645 m), Col de l'Iseran (2770 m), but few hardly known ones, like Parking du Laus, Le Saut, Plan de Lac (2360 m) - one of my favourite. On the climb of Col de la Lombarde I saw chamois, unfortunately only for few seconds, but in the year 2014 on a hardly known italian ascent (will be presented in few weeks time ) offered me the opportunity to record 2 chamoises for video for ca. 1 min long. At La Bonette (2802 m) I got the best amazing weather that I could: sunshine with very small clouds, cumuluses. My following video is about a hardly known climb in Italy (at the end of the Valle di Lanza), but it was amazing ! I felt as at the end of the world: only the nature and me. 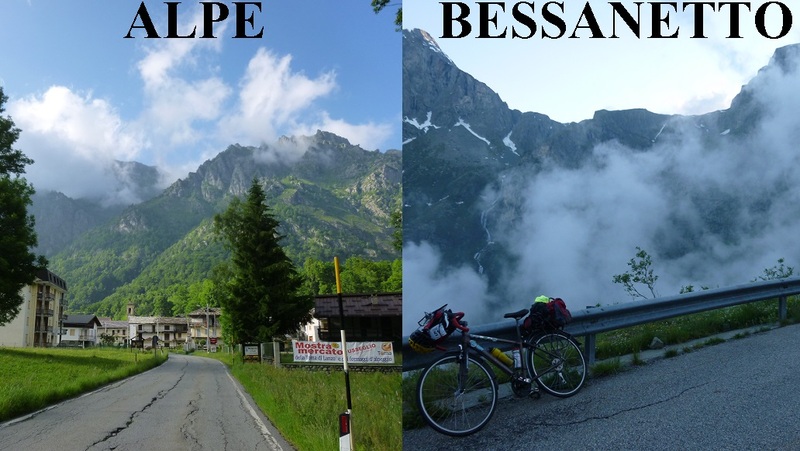 It went from Usseglio towards Alpe Bessanetto; the asphalt finished at the height of 2022 m.
Above the clouds it was wonderful, breathtaking.... At halfway I kept on cycling although there was a barrier. (In the Alps it is usual that mountainroad addict cyclists go upwards by such situations. There are private roads where cyclists go upwards, although the road is only for the employees of the owner company.). On the road I met with small and big rocks had fallen earlier from the mountainside.... After going above the clouds it was like a miracle. It was wonderful: the view, the waterfalls and ... chamoises ! !